A4A Art for Architecture have extensive working experience and practical design sense to undertake large-scale public art projects drawing on nearly twenty years of sculpture experience. We work with a variety of media, including large cast bronzes and stainless steel structures, portrait statues, glazed brick architectural reliefs, metalwork fabrication, stone and cast stone. 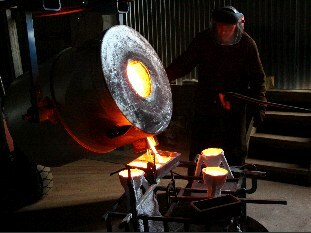 We have our own studio foundry where we cast bronze sculpture of our own work and other artists if they wish. This cumulative mass of experience over the years and genuine creativity has enabled us to resolve many artworks leaving as many delighted collectors, clients and the public to enjoy our work for generations to come. John Mckenna leads the collaborative group 'Art for Architecture', an informal association of artists, designers and craftsmen who work together in a wide range of media on public art commissions. John's own work varies in scale from portraits and small private commissions, to large works of public art. The Artworks are usually site responsive, often drawing inspiration both from the immediate environment and the local history of individual areas. John will undertake the project with his own sculpture assistants or draw upon the bank of expertise within the a4a associates. John studied art and design in London and in 1987 was awarded a three year bursary to study under the patronage of Dame Elizabeth Frink at the Sir Henry Doulton School of sculpture, in Staffordshire. He exhibited alongside Frink with other members of the Sir Henry Doulton School at Keele in a retrospective of her work. Since 1993, after several years of lecturing in sculpture, John has worked primarily on public art schemes throughout the UK, initiating his own concept or working to design briefs from architects, developers, councils, local authorities and public art agencies. He is a member of the Royal society of British Sculptors and has exhibited in London and various locations countrywide.
" Works of public art that we create, commissioned by local authorities, councils and corporate clients, aim to stimulate and inform observers. We at a4a can take an initial brief and develop a unique artwork for a public site, resolve the design to a feasible solution within timescales and to budget. We have extensive working experience of a variety of media and scales, including large cast bronzes and aluminium, glazed brick relief friezes, stone and cast stone, terracotta, fibreglass and welded steel. " John's smaller artworks such as portraits and figurative sculpture, achieve balance, sensitivity and quietude for the observer, often seeking to pacify the senses in an increasingly demanding environment. For his portrait works, the artist models in clay for casting into bronze, the use of which permits a more detailed and realistic manner of modelling. John's attention to detail is present in all aspects of his work: this combined with imaginative design, reveal a genuine interest, enthusiasm and passion for his craft. Public sculpture is accessible and holds a special interest to people. Commemorative statues of famous people, places and events, become a focal point for memories and celebrations. Sometimes the work can be challenging. A modern sculpture sited in a city often begins its life surrounded in controversy and over time becomes dear to people's hearts. Monuments become landmarks, raising profile and creating impact. The unveiling of a new sculpture very often makes front page news.